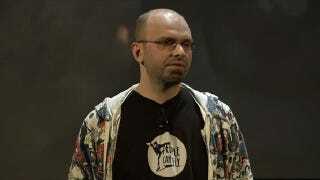 People Can Fly, the Poland-based studio behind 2011's Bulletstorm and the upcoming Gears of War: Judgment, said goodbye to creative director Adrian Chmielarz (pictured) and two top artists today, according to Gears developer Epic Games and Chmielarz himself. "Gears fans, you're going to love Judgment. It's in great hands," Chmielarz said via Twitter about 1 p.m. EDT. "And don't worry, you'll hear about my plans soon enough." In a statement provided to Kotaku, Epic president Mike Capps acknowledged the departure, adding that two others also had left. "Adrian Chmielarz, Andrzej Poznanski and Michal Kosieradzki have parted ways with People Can Fly and Epic Games in order to pursue other opportunities, which they will announce of their own accord," Capps said. "Over the past decade, they have been instrumental in building People Can Fly into the talented team that it is today. We wish them well in their future endeavors. People Can Fly remains excited to release Gears of War: Judgment to fans early next year." Chmielarz follows another Gears-related departure: Rod Fergusson, Epic's director of production, last week confirmed he'd left to join Irrational Games to assist with finishing up a troubled BioShock: Infinite, due for release next year.